Careem and Dubai’s Roads and Transport Authority (RTA) are delighted to announce the establishment of an E-Hail Taxi Joint Venture. 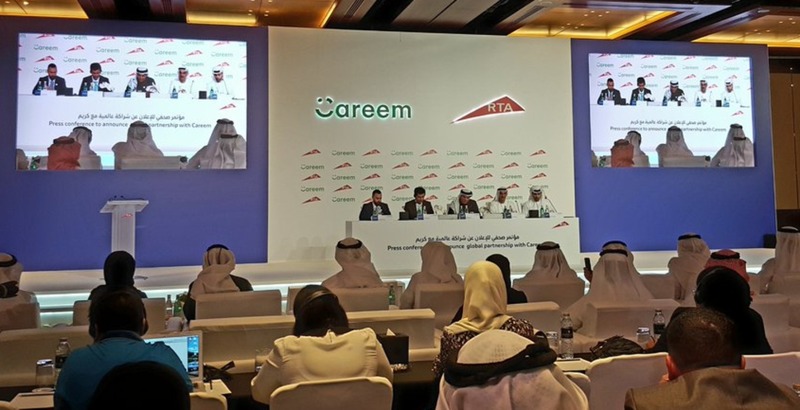 Careem and Dubai’s Roads and Transport Authority (RTA) announce E-Hail Taxi Joint Venture. The new company, the name and logo of which will be announced in the next few months, will cater to the e-hail taxi service to customers as of April 2019. The e-hail taxi market for limousines will remain open for the existing operators without any change. It will be 51 percent owned by the RTA and 49 percent by Careem and the revenue for the company will be derived by a fixed booking fee per ride booked via the app. The customer experience will mirror that of ride hailing for private cars (limos) and customer will get ETA of just a few minutes as opposed to the current average for taxis for calling a ride, which is 10 mins. Once booked, customers will be able to live track their ride, see an up-front fare estimator and use the digital payment option via a registered CC on customer profile. It is planned for carpooling, buses and other transport modes to also follow as well as a planned roll out of this model to other markets, all handled by the new company. A statement to this effect was made during a press conference held by HE Mattar Al Tayer, Director-General and Chairman of the Board of Executive Directors of the RTA, and Mudassir Sheikha, Co-founder and CEO of Careem. A host of CEOs of the RTA and senior executives of Careem were also in attendance. “This initiative stems from RTA’s keenness to implement the directives of HH Sheikh Mohammed bin Rashid Al Maktoum, Vice-President and Prime Minister of the UAE and Ruler of Dubai, to transform Dubai into the smartest city in the world. It also aims to bring happiness to people, deliver classy services to tourists and enrich customers’ experience,” said Al Tayer. “The step has been made possible, thanks to the follow-up and support of HH Sheikh Hamdan bin Mohammed bin Rashid Al Maktoum, Dubai Crown Prince and Chairman of the Executive Council; and HH Sheikh Maktoum bin Mohammed bin Rashid Al Maktoum, Deputy Ruler of Dubai and Vice Chairman of the Executive Council. The initiative is consistent with the global trend of planning urban transport aimed at easing mobility and reducing the reliance on private vehicles. “This partnership is the first of its kind worldwide between a government transport authority and a private entity specialised in taxi e-hail business. It sets a model of an excellent partnership in running comprehensive public transport systems shared between the public and private sectors. The e-hail has become the most effective tool of matching the supply with demand, and offering clients a smooth experience in obtaining taxis,” commented Al Tayer. “Establishing the new Joint Venture supports Dubai’s Integrated Mobility Platform (S’Hail); which enables customers to access to all transit means through a single window (smart app). It integrates RTA’s transit means (metro, tram, buses, marine transport means, and taxis) with the transit means provided by other parties in Dubai, such as limousine companies. “Through this new company, the RTA intends to leverage the taxi sector in Dubai. It involves raising the efficiency of taxis in Dubai through enhanced accessibility of vehicles and their online booking and reducing the expected waiting time for the vehicle. It also entails a host of advantages to clients such as making a direct online payment via the app, charting the most suitable journey route, sharing the ride with others, and displaying details of the vehicle & driver, in addition to an option for providing the service with a chauffeur,” explained Al Tayer. “It also enables the launch of new transit services in future such as shared journeys, and supports RTA’s efforts in achieving multi-modal integration, besides offering short-journey service (first and last mile); which assists public transport commuters to reach their final destination. “Since inception, the RTA had invested about 100 billion dirhams in constructing the infrastructure of roads and public transport projects to match the growing needs for transport in Dubai. The future direction of the RTA is to invest in technological solutions and smart services to ensure the optimal and most efficient use of the infrastructure. The RTA has chalked out plans and identified the detailed requirements for revamping the taxi sector in partnership with a world-class operator. Many global e-hail companies were immensely interested in teaming with the RTA as Dubai offers excellent business prospects and has a global reputation as an attractive business haven,” he noted. “Five of the big e-hail taxi companies operating in the global market have submitted technical and financial proposals. Careem was selected after the assessment of submissions made. Careem will cater to the provision of the e-hail technology, and the management of bookings & drivers through its existing app; which is flexible and user-friendly. “The e-hail of about 10,843 taxis will be exclusively run for a limited period by the new company; the name and logo of which will be announced in future. The new company will start passenger service in April 2019, and the online booking market of about 6450 limousines will be open for companies operating in the sector, without any change,” concluded Al Tayer. Mudassir Sheikha, Co-founder and Managing Director of Careem, welcomed the partnership and cooperation with the RTA, and said: “Careem’s journey to simplify and improve the lives of people in the region, started here in Dubai – this is Careem’s home, its source of inspiration. Over the last six years, the technology that we have developed here in Dubai has delivered hundreds of millions of rides and transformed the way people move around in 120 cities of our region”. “Entering into this exciting public-private-partnership with the RTA will allow us to use that technology to make Dubai’s sophisticated transportation infrastructure even more accessible and convenient. Combining our technology capability with RTA’s vast industry knowledge, we will build a platform that delivers broader choice, optimum customer experience and reliable, safe transportation for everyone,” added Sheikha. The newly formed company will be 51 percent owned by the RTA and 49 percent by Careem and the revenue for the company will be derived by a fixed booking fee per ride booked via the app. The new company will handle all aspects of the e-booking experience and fleet management, including training and incentivised customer rating system, better performance, better chances of more bookings, vehicle inspections and customer service. Previous Article Have you tried Careem’s Send Credit feature?